This entry was posted in Uncategorized on April 3, 2015 by piouswishes. Students wading into the vast ocean that is OT studies have their work cut out for them. Not only are they expected to know the various forms of scholarly critical tools that are used in interpreting the text (literary, textual, form, etc.) and to understand the diverse genres that make up the Hebrew Bible, students are required to gain competence in two ancient languages in order to scratch the surface of the study of the OT. Thankfully, scholars in recent years have released some really solid introductory texts that have helped students become more comfortable with the OT’s history and languages. 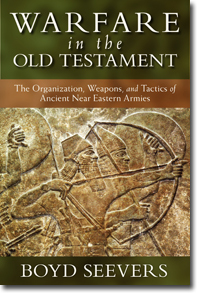 Boyd Seevers’ work Warfare in the Old Testament follows in this line of publications. It is one of the first works that offers an introduction to the history of warfare during the OT times that is accessible for students seeking to better understand how warfare played a role in the history of Israel and her relationship to the surrounding nations. Seevers divides this work into six major sections devoted to a specific empire that is relevant to the time period of the OT. Seevers opens each section with a fictional story of a soldier’s life in that empire’s military. These offer a nice break from the usual textbook fare but some students may find them hokey and out of place. After the initial story, Seevers then offers information related to the dating of the empire and a description of its weaponry, tactics, and the various units that made up its military. One of the strongest parts of the work was the obvious care that went into its production. The author offers full color pictures and images of various drawings used to illustrate weapons and soldiers’ uniforms. The maps are detailed and are provided alongside almost every description of the army’s movements and common battle sites. Overall, the work is as good looking as it is informative. Another thing that this work does well is offer the actual Hebrew fonts instead of transliteration. I have never quite understood why any publisher would only provide the transliteration, seeing as one who does not know Hebrew would not benefit at all from a transliterated text. Thankfully, Kregel offers the actual Hebrew so that students with some competence in the language can reference Seevers findings to BDB or HALOT. My one small complaint is the use of endnotes instead of footnotes. Whenever I want to go deeper by reading his notes, I have to place one finger in the back of the chapter so that I can move rapidly between endnote and main text. However, this is a very small complaint and in no way diminishes the content of the work. Seevers is to be congratulated for taking a specialized and potentially complex subject and boiling it down into a book-length treatment that is accessible for the student. Those seeking to understand the role of the military in Israel’s history should look no further than Warfare in the Old Testament. I received this book for free from Kregel in exchange for an unbiased review. This entry was posted in Uncategorized on March 13, 2014 by piouswishes. A whole lotta ink (both digital and actual) has been spilled over the issue of Paul’s use of αββα. While I am not going to rehearse here why “αββα” isn’t “daddy”, I will make one comment that I have not heard scholars make about Paul’s use of “αββα” in Romans 8:15. A plethora of scholars hold that the letter of Romans was written to a mixed congregation of Jewish and Gentile Christians (although the latter made up the majority). Paul’s purpose in writing the letter is not only to promote solidarity with the Roman church and raise funds for his trip to Spain, but also to build church unity. Paul’s exhortation to the stronger to give up their rights on behalf of the weaker lends credence to the idea that in-house debates between Gentiles and Jews over food laws were promoting disunity rather then love. For this reason, when Paul comes to chapter 8, before his middle section concerning the place of Israel in the purposes of God, Paul describes our status as sons and daughters because of the Spirit of God (and not because of our ethnic status). Paul uses the common Christian name for God in the two languages used in the church (Aramaic and Greek) to unify them around their common God. 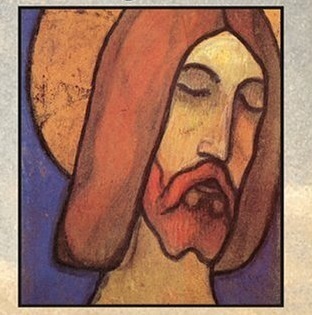 Although Christians may use the term today, there is nothing magical about the term. You may as well say πατηρ! This entry was posted in Uncategorized and tagged aramaic, father, greek, paul, romans on September 7, 2013 by piouswishes.